As a creative, you probably don’t need to be told to work on your art. You would do it even if no one was paying you to do it. That’s how much you love it. It’s your passion. I don’t want to tell you how to do your creative work either. Whether it’s taking photos, writing poetry or painting murals, you should be an expert at your craft already. If not, then keep going. Keep making more art. You will improve. But there are a few things I want to share with you about the strategic aspect of making your art. For many artists, their art serves them. There’s nothing wrong with this. If you love working on your art and it fulfills you, more power to you. 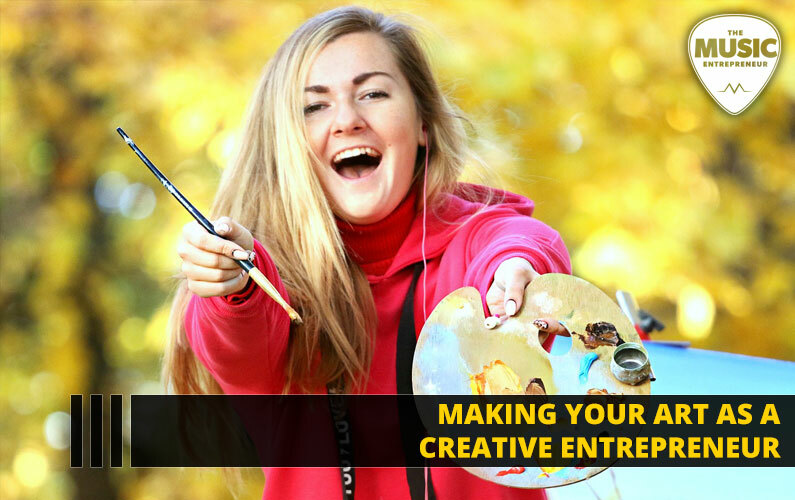 But if you consider yourself a creative entrepreneur, or you’re thinking about becoming one, then you’re going to want to take a different approach. If your art only serves you, it can be an uphill slog trying to find an audience. I once interviewed Jack Conte for my blog. He’s one half of Pomplamoose and CEO of Patreon. Pomplamoose found success on YouTube through the video song medium. But this didn’t happen overnight. Jack says they kept adapting and iterating until they found a formula that appealed to their audience. That involved taking popular songs, reharmonizing the chords, keeping the melody, adding unique instrumentation, and documenting it all in the form of a video song. Some artists call this selling out. I just call it being mindful of what your audience wants. If you want to find a market to sell your art to, make it your mission to serve an audience. People are now bombarded with texts, emails, instant messages, social media notifications and so on. This underscores the importance of staying top of mind with your audience. And, if you want to stay top of mind, you’re going to want to show up for them as often as possible. Today, if you were to ask me whether it’s better to be prolific or a perfectionist, I would tell you it’s better to be sustainably prolific. I admit that it’s a loaded question. Some artists I know don’t want to put out anything they can’t ultimately be proud of. I understand that perspective. The only problem is that a few years down the line, you may not feel the same way about it. A “hit” can sometimes be a double-edged sword. Do you think Van Halen loved performing “Jump” every single time they went on tour? With all the touring they did, I imagine there were times when they didn’t want to go up on and play that song. So, what’s perfect to you now may not be perfect to you a few years down the line. Do you see how that can be a trap? If you want to keep your audience engaged, you need to keep sharing your art — even if it’s half finished — preferably daily. I’m not suggesting that it’s a matter of quantity over quality. I’m suggesting that it’s about finding a healthy balance between the two. The reality is that your fans may end up liking the creations you hate, and you may end up liking the creations they hate. So, you can’t make any assumptions about what people may take a liking to. Let’s say you’re an illustrator. You love to draw and create pictures. But you’re also tech savvy. You understand how search engine algorithms and keywords work. So, you begin producing new drawings every single day, as often as you can. These works are then shared on your blog, Behance, Etsy, DeviantArt and other sites. Now, you know how hard it can be to stand out as an illustrator. But because you’re creating new work every single day and sharing it with the world, you’re going to pick up momentum. This is particularly true if you choose an underserved niche. You could spend your time drawing a lot of different things. But if you did that, it would take you a while to gain attention for your work. Meanwhile, if you spent all your time drawing purple dragons, and you had hundreds of purple dragon drawings, you would dominate that niche. Trust me — I looked it up, and the competition isn’t that steep (as of this writing). The added benefit being that if someone searched for a purple dragon in Google and clicked on “Images”, they would see your work. So, not only would you be serving a niche audience, you would be effectively marketing your work as you’re creating it. You would be hitting two birds with one stone. In general, I don’t find artists love marketing. So, if your creating and marketing efforts went hand in hand, it could make your life a lot easier. This is the ideal to strive for, but it isn’t possible in every situation. Sometimes you will have to prioritize your marketing efforts — publishing blog posts, sharing your work on social media, sending emails to your audience and more. But can you see how being prolific would play right into hitting two birds with one stone? So, you need to make your art. But you also need to promote it. There’s no two ways about this. What many artists do is create their art and hope that someone discovers them. This is not the way the world works anymore. You need to be the first to make your presence known. You need to be able to communicate your value to others. So, why not plan for success? Create a strategy for yourself. Consider how you’ll be marketing your art. Think about how much time you’ll be spending on it. Research and find the best channels for sharing your work with the world. Your plan doesn’t need to be perfect. What matters is that you have a plan. You can’t steer a parked car. But once you get going, it becomes much easier to know when you need to course correct. Just ensure that you have a clear destination in mind. If you don’t, you won’t know when you are off track. One thing my mentors taught me was that success doesn’t happen by accident. It requires planning. So, be intentional about the steps you take to get to where you want to go. Every business has a product or service to sell. Your product is your art. Set aside any preconceptions you may have about marketing and selling your art, such as how much you can charge for it or whether people will buy it. If you make it and get it in front of people, you will discover that many people are willing to pay good money for your creations. But you do need to find a way to get it in front of people. That’s key.